I’d like to talk about the finances - and potential financial conflict of interest - at the National Board of Medical Examiners. This is gonna be a long one - but thanks for hearing me out. Yesterday, I started a discussion about how our focus on #USMLE Step 1 was hurting both undergraduate and graduate medical education. It’s gotten a lot of attention, probably because I highlighted a comment from the CEO of the NBME that touched a nerve for a lot of you. ...but loss of revenue to the @NBMEnow was not mentioned. Y’all, come on a journey with me. A journey of speaking up, high stakes testing in medical school, and Netflix jokes. This is the state of USMLE Step 1. Recently, some medical students spoke up about a problem they saw with a big test that we all take called Step 1. First, some background. USMLE Step 1 is a super high stakes test after the first two years of medical school. Your score on the USMLE Step 1 basically determines the fate of your medical career - score well, and the doors to residency are open. Score low or fail, and well, tough luck. Give up on your dreams of entering a competitive specialty and maybe on being a doctor all together. First, a reminder. The USMLE is a licensing exam. It is intended to discriminate between test-takers with sufficient content mastery to be licensed as a physician, and those who do not have such mastery. So first of alll, it’s not entirely clear what you are measuring when you have an applicant with a 225 and a 245 and a 265. Today, I reviewed course feedback for a second-year medical school course. In response to a request for areas for improvement, one student wrote this. The sentiment is extremely common, but rarely have I seen it stated so succinctly. 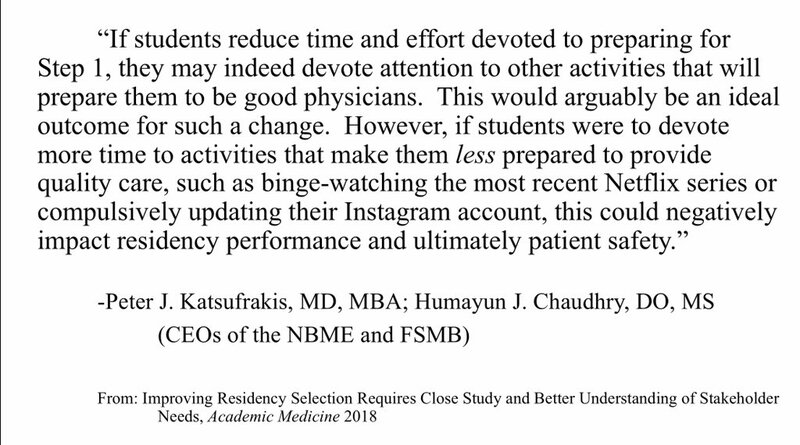 We have a major problem with the overextension of #USMLE Step 1. I’m not the first to point this out. But to the extent that the product of medical school/licensure is a public good, can we please start asking questions about whether our systems are producing the good we desire? One obvious solution is to report USMLE Step 1 scores as Pass/Fail. This is, after all, what the test was designed for - to broadly determine which candidates have sufficient subject mastery to be licensed. ١- نظام الرزدنسي والتعليم الجامعي للاطباء في السعودية مطابق لهذه الدولتين .